Contamination; mixing the bad with the good. In this case, getting Ebola virus on yourself. As a worker takes off protective clothing is when they’re most likely to get exposed. Every effort to make the awkward disrobing process easier is a step in the direction of increased safety. Turns out that tabs are a great feature for making this happen. One source of maker innovation comes from applying the ideas of one discipline to another. In this case, looking into wet suit design provided insight for improving PPE suits. Everybody knows that removing a back-entry wet suit starts with pulling down a zipper with a long strap attached. Why not do the same with PPE and add straps to back-entry suits? Also, to have the greatest impact on the current Ebola epidemic it would be cheaper and speedier to apply retrofits to existing equipment. So where could tabs or straps be added to a PPE to make removal easier and safer? Under the leadership of Nicole Daphne Tricoukes, a team which included Kailey Shara and Brian Russell set out to answer that question. The results were three distinct sets of tabs which could be added to existing suits which enhance safety while disrobing. First, to peel off a back-entry PPE suit requires a bit of physical gymnastic and if you’re trying to avoid contamination this isn’t a good thing. Ideally clean hands would only touch the clean interior of the suit to pull and remove it. Problem is, there’s nothing to grasp normally. 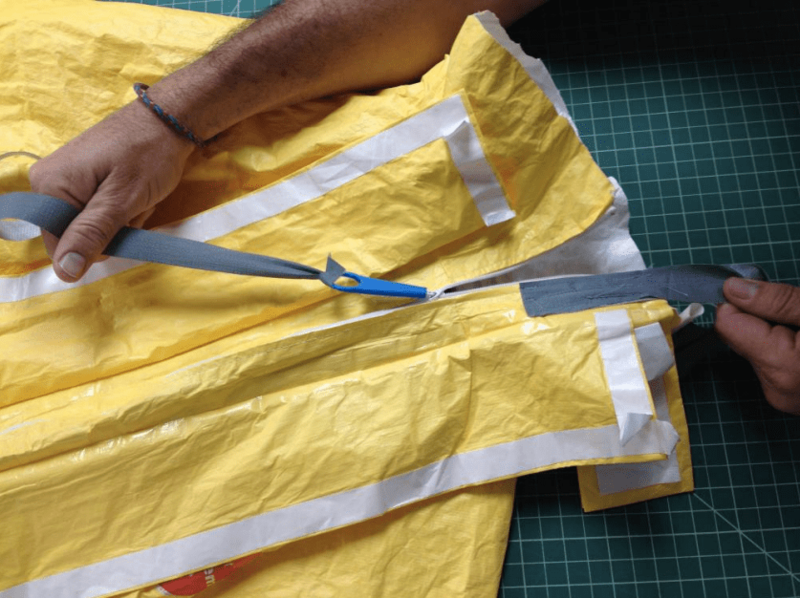 However, by adding tabs inside the collar flaps you provide a gripping point to pull and peel. This is a cheap retrofit solution that can be added to existing suits. Second, if you watched the PPE disrobing video you’ll know that getting the pant legs off over the boots is a clumsy process. It’s just plain hard to get the cuff over the heal to begin slipping the boot up through the pant leg. What if a tab was sewn at the base of the leg? As you see above, the other foot could step on the tab thereby securing the cuff and allowing the boot to be pulled out of the suit in a much less clumsy and therefore less unsafe manner. Again, an inexpensive retrofit to existing PPE inventory. Third, while the tab extenders made grasping the zipper easier, the use of long straps makes unzipping simpler as shown at the top. 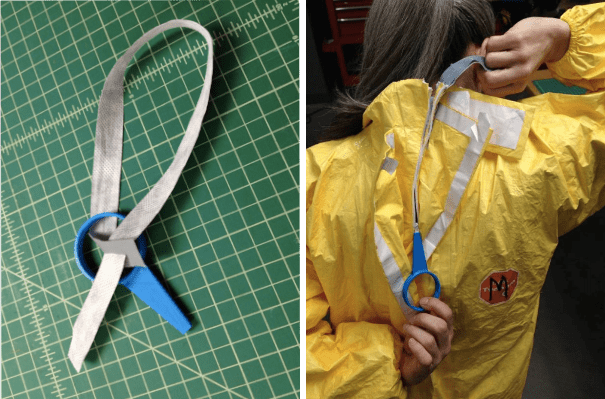 One strap is attached to the PPE collar while another is attached to the zipper tab extender. The first strap secures the collar while the second strap pulls to unzip the PPE. Opening the suit safely is a critical first step to releasing body heat build-up and beginning the recovery period. Best of all? This is again a cheap retrofit. The design guidelines for this project call for low-cost, easy to produce, quick to deploy, and impactful solutions. These uses of add-on tabs are wonderful examples of this.